Radiology is the area of medicine that uses X-rays, magnetic waves and ultrasound to obtain detailed images of the inside of the body. Doctors can then use those images to detect and diagnose illnesses and injuries, as well as to help develop treatment plans. The Radiology Department at Centennial Hills Hospital Medical Center offers radiology (also called imaging) services to residents of Northwest Las Vegas and the surrounding region. The hospital is accredited by the American College of Radiology (ACR) for computed tomography, nuclear medicine, mammography, magnetic resonance imaging and ultrasound. Below are descriptions of some of the imaging tests available at Centennial Hills Hospital Medical Center. Ultrasound is a noninvasive, non-radiation examination that uses sound waves to detect disease and locate possible abnormalities in breast tissue. Ultrasound systems at Centennial Hills Hospital Medical Center are designed to provide doctors with precise images for efficient diagnosis of breast problems. The system enables the physician to perform high-resolution panoramic imaging or 3D scanning in real time. Computed tomography (CT) is an imaging test that creates detailed images of internal organs, bones and tissue. The images generated during a CT scan can be reformatted into three-dimensional images viewed on a computer monitor, printed out or transferred to other media. Centennial Hills Hospital Medical Center uses a 64-slice scanner, as well as a 128-slice scanner for CT examinations. Each time the scanner rotates around a patient's body, it uses low radiation X-rays to create 64 or 128 high-resolution slices (images). Because the scanner circles a patient's body about four times every second, patients lie inside of the CT machine for two to three minutes. Digital mammography is a system to detect breast cancer or other abnormalities. It is replacing traditional x-rays with electronic pictures of the breast. These mammography systems are similar to those found in digital cameras. The images the radiologist reviews are sharper and clearer than film x-rays and the patient's mammogram requires a lower dose of radiation. The radiologist reviews and stores the mammograms on a computer. The woman's experience during a digital mammogram is almost identical to the one she would have during a film mammogram. The only difference she might notice is that her mammogram is now available to her on a compact disc (CD) rather than on a large piece of film. Magnetic Resonance Angiography (MRA) is the use of MRI imaging to study a patient's blood vessels after the injection of a contrast material. Unlike conventional angiography, which is an invasive procedure, MRA is noninvasive other than an injection with a needle to administer the contrast material. This technique can be used to obtain images of arteries in the brain, heart, kidneys, gastrointestinal tract, aorta, neck, chest, limbs and pulmonary system. Magnetic resonance imaging uses radio waves and a strong magnetic field to create clear, detailed images of internal organs and tissues. Since X-rays are not used, no radiation exposure is involved. Instead, radio waves are directed at the body. This exam takes 30-50 minutes on average and consists of several imaging series. Many studies will require a small intravenous injection of a contrast agent. However, this agent does not contain iodine, an element used in other contrast agents for X-rays or CT scans. MRI is often used to evaluate or diagnose tumors and diseases of the heart, liver and bowel. It is also sometimes used to monitor an unborn child in the womb. Radiologists at Centennial Hills Hospital Medical Center use nuclear medicine imaging to obtain detailed images of the body to help them identify disease. Nuclear medicine, which uses radioactive material to diagnose and determine the severity of disease, offers unique diagnostic information about the function of many organs in the body that other imaging methods may not provide. This form of imaging can often identify abnormalities very early in the progression of a disease; this enables treatment to begin at the earliest stage of a disease. 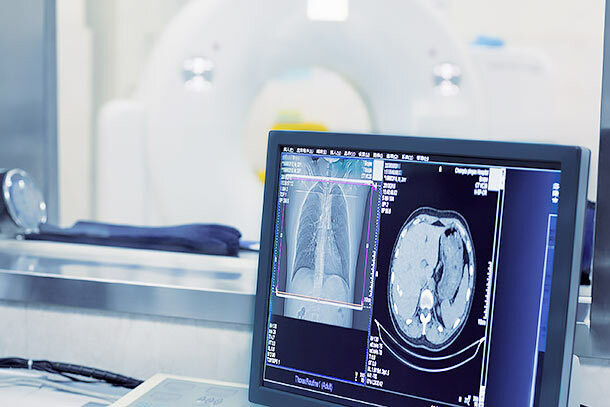 Nuclear medicine is used to diagnose and monitor a wide range of diseases, including various cancers, heart disease, endocrine, gastrointestinal and neurological disorders. X-ray (also called radiography) uses a very small dose of radiation to produce pictures of the inside of the body. X-rays are the most frequently used form of medical imaging and they are also the oldest. They are often used to help see bone fracture, injuries or infections; they are also used to locate foreign objects in soft tissue. In some cases, X-ray tests are used in conjunction with an iodine-based contrast material, which is swallowed, to help doctors see certain organs, blood vessels or tissue. To learn more about Centennial Hills Hospital's advanced diagnostic and imaging services, call 702-629-1155.